Ed has a demanding but interesting job. His official title is “Team Lead of Field Development Planning”. What that means is that he leads a group of reservoir engineers and a geomodeler in developing a new coal seam gas play in New South Wales. The reserve auditors tell him that it is one of the most complex reservoirs that they have worked on. Ed is a great mentor and team lead and often comments on what a great team of people he has to work with. His team is a multinational group of young men from Australia, Scotland and Poland (and Ed, the Canadian.) Ed also has the respect of the senior management and executive team, even when they don’t always like what he has to say. His work environment is an open office cubical work space concept that allows for lots of interaction on the floor. At first he missed his office but has grown to appreciate the merits of this type of work space. Ed works in the city center, known here as CBD – Central business district – or the City, for short. I am still catching myself saying “downtown” but I am getting better. 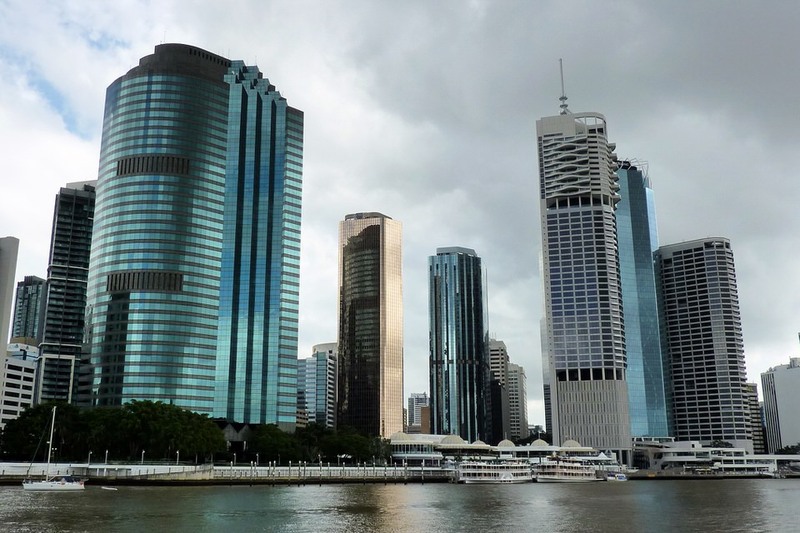 Brisbane CBD is really a delightful place, having a good mix of office towers, hotels, lots of shopping, museum, gov’t buildings, churches, parks and gardens, memorials, statues, restaurants, cafés, and more. Yet, it is compact and easy to explore. Look for another post featuring the CBD. Sometimes I go in to the city to meet Ed for lunch or dinner and to take in a little shopping. Actually I use it as an excuse to ride the City Cat ferry. Ed and I have “Go cards” which are transit cards that enable us to travel on the ferries, trains, and buses. We simply tap the card on and then off again and the cost of the trip is taken off of the card. I have them set up to automatically top up when low. It is so convenient. It is also more economical to have a card as it greatly reduces the cost of travel. One of the things that I appreciate about Brisbane. While I take the occasional trip on the ferry, Ed takes it every day to get to and from work – a 20-30 minute trip. It is the finest way to travel to work and we are so thankful that we landed in a neighborhood that is by the river. 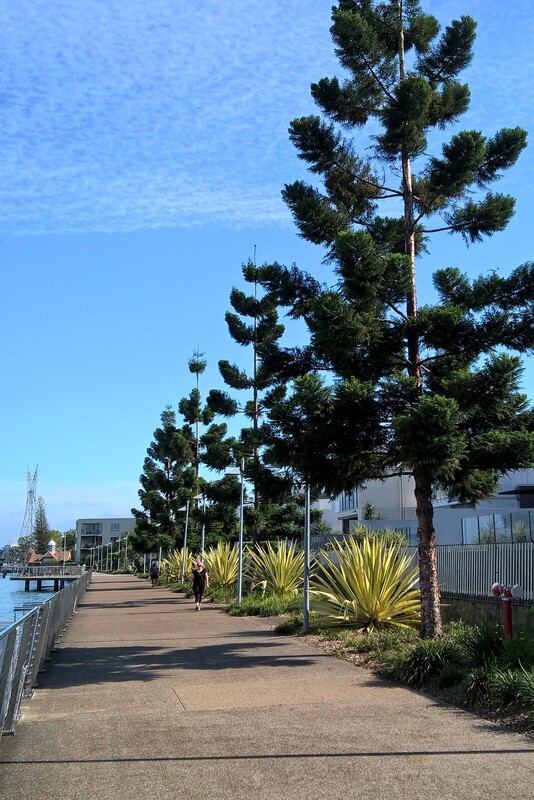 It takes Ed 5 minutes to reach the Bulimba ferry station, which is a pleasant walk along the water. Since the ferry runs every ¼ hour, it is only a short wait for the next one. 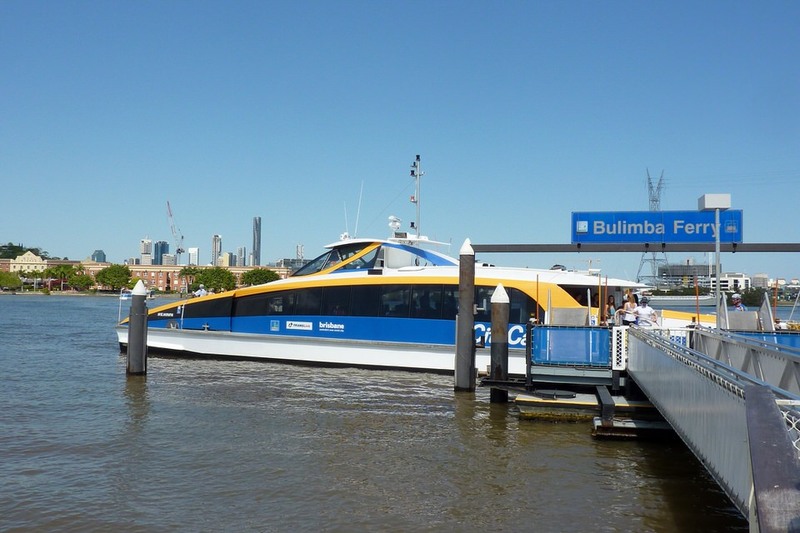 Here is a picture taken at the (old) Bulimba Ferry station and of one of the ferries that he will take in to work. They are fast and great fun to travel on. After a 20-30 minute ride, Ed arrives at the Riverside station at Eagle Street Pier. 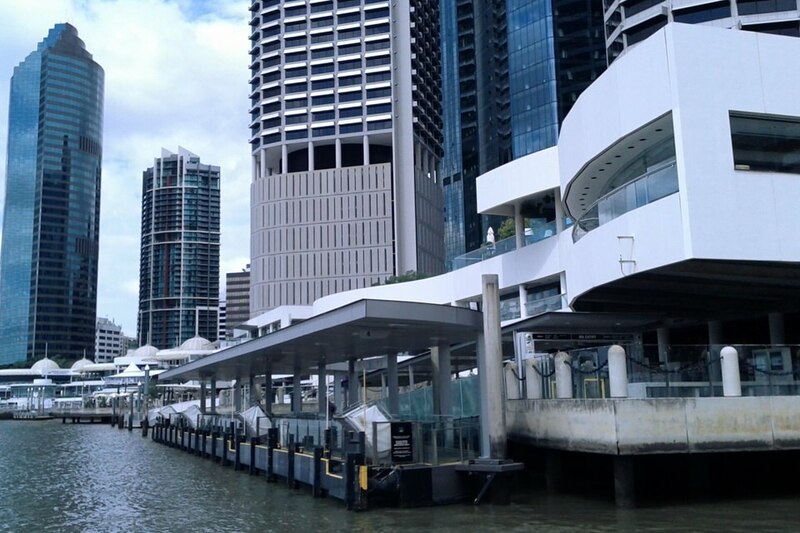 Eagle Street Pier is a beautiful architectural location and is full of restaurants. (Another post later) Ed’s office is close by (within minutes) on Creek Street. 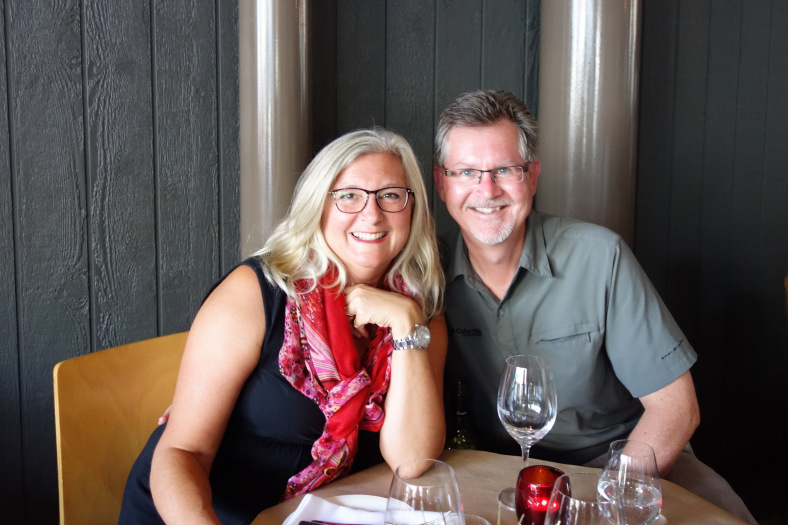 Ed works very hard; long days and sometimes weekends, lots of pressure, but the load is lightened slightly by small joys of traveling to work on a boat, and enjoying the occasional dinner out in the warm air by the river. 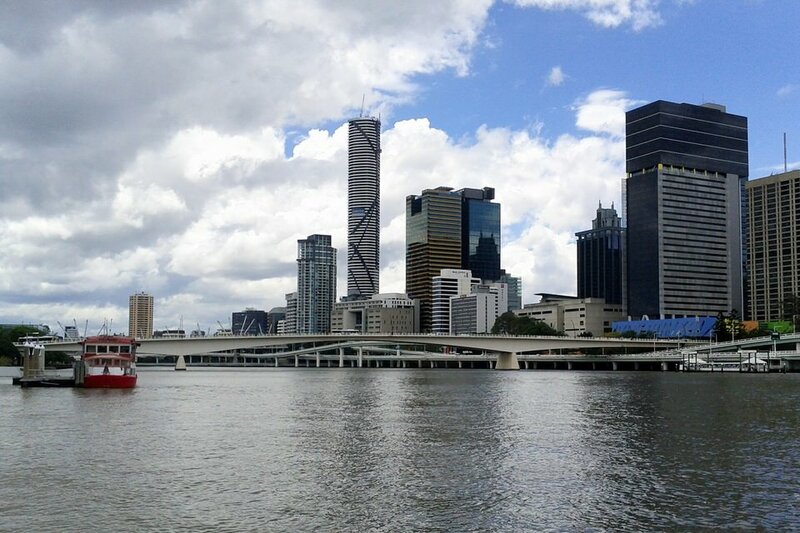 This entry was posted in Our Brisbane Life and tagged City Cat Ferry, Eagle Street Pier. Bookmark the permalink. Well done Di. The pictures alone tell the story but I love your narrative. Thanks for the updates. I sure wish it was spring here! 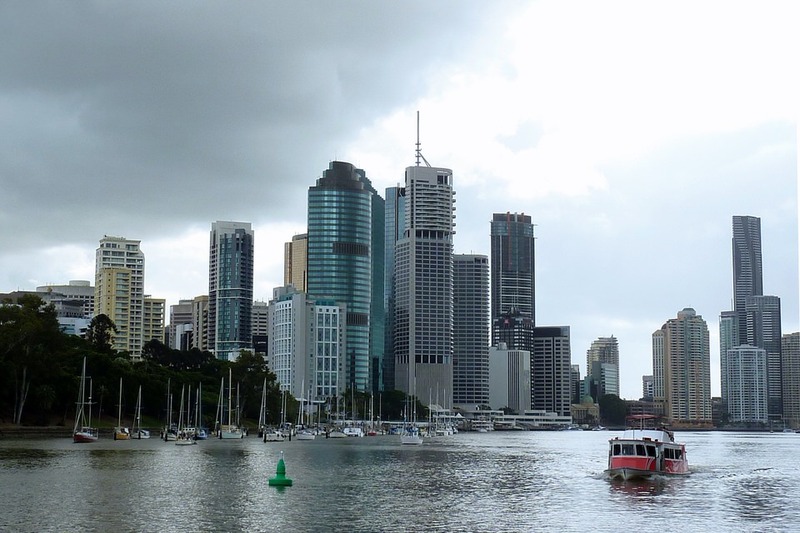 The pictures from the first two posts are beautiful and Brisbane looks like a great city.